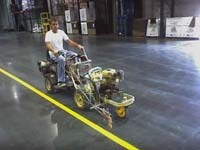 Over the years, PL Striping Inc. has specialized in the application of warehouse striping. Customers with varied needs have come to trust our expertise, our workers attention to details, courtesies, and knowledge of safety and procedures in their warehouse. Cummulatively, we have completed projects which total over 1 million linear feet. Depending on your requirements, two of our most popular concrete floor striping systems for your warehouse are PL traffic/plus and PL Supreme. Both of these systems come in a gloss finish, with a wide range of colors available, and cure in 24 hours. PL traffic/plus is a top quality latex traffic paint with a gloss urethane top coat. This is our most popular application on warehouse concrete floors. PL Supreme is a gloss epoxy based product designed for application to concrete floors. With proper inspection, both PL traffic/plus and PL Supreme may be applied to clean, new construction, concrete floors. They both have a tenacious hold and durability without the high cost of shotblasting.